As ’the infantry’s artillery’, mortars could provide infantry units artillery-like fire support when artillery either was not available, or could not be moved forward fast enough. The finned projectile, known as a 'bomb', is dropped down the barrel, fin end first. The primer strikes the fixed firing pin, which detonates the primer and ignition cartridge in the base of the bomb, which in turn ignites the propellent, forcing the bomb out of the barrel, carrying the primer and cartridge with it and readying the mortar for the next round. 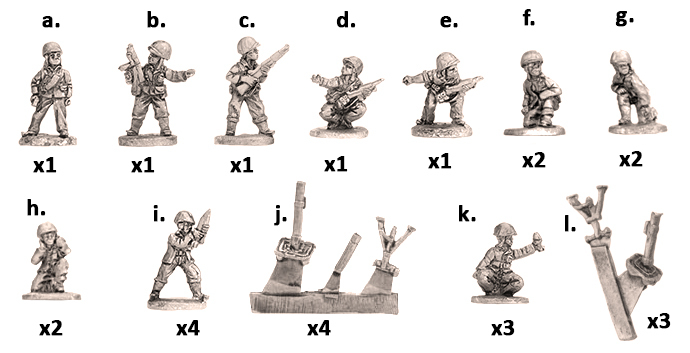 This blister pack lets you choose from two different mortar platoon options fielded by the US Marines in the Pacific: the 60mm Mortar Platoon, with up to three M2 60mm mortar, or the Mortar Platoon with up to four M1 81mm mortars. 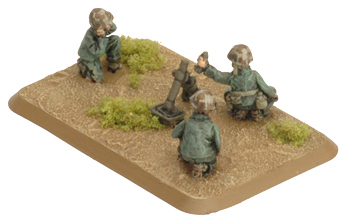 The Marines operating the M2 60mm mortar were often the first called upon to provide fire support to their comrades in the rifle platoons. Advancing right beside and suffering the same privations as their more storied brethren, the light mortar men could set up and fire within seconds, delivering a bombardment far before heavier weapons could respond. During the night the crew of the 60mm mortar also played an important role in stopping Japanese infiltration attacks. 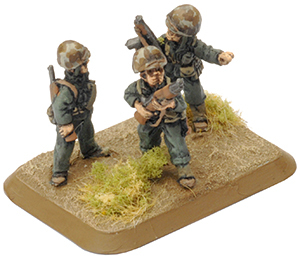 Deployed on the front line they could fire illumination shells to warn the Marine Riflemen that an attack was underway. 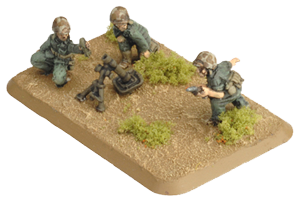 M2 60mm mortar Man-packed 24"/60cm 2 1 3+ Minimum range 8"/20cm. 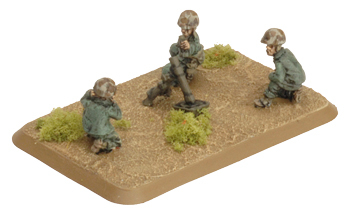 The next step up in firepower that supported the Marine rifle company was the M1 81mm mortar, which appear in the Mortar Platoon, the second option which you can make with this blister pack. Capable of laying down heavy barrages of high explosive shells, the 81mm mortar was the largest weapon available at battalion level and would often be deployed in support of the Marines at the front. As they could fire at a high trajectory they were perfect for hitting Japanese soldiers hiding in defilades wanting to attack. 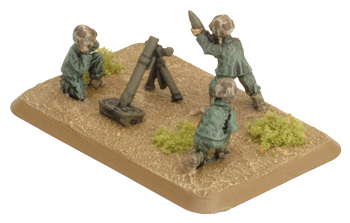 The four mortars assigned to each battalion would work closely with the Marine riflemen to spot targets. The 81mm mortar platoon was often the target of counterbattery fire due to the devastating effect that could have on an infantry attack. 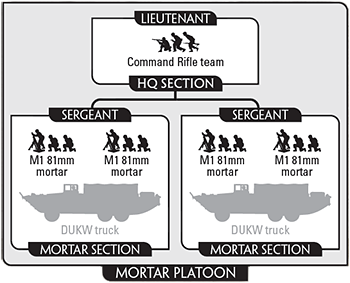 You may choose to add a DUKW Section to transport your Mortar Platoon into battle. 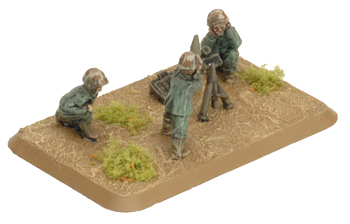 M1 81mm mortar Man-packed 24"/60cm 2 2 3+ Smoke, Minimum range 8"/20cm. Firing bombardments Man-packed 40"/100cm - 2 6 Smoke bombardment. Sometimes your weapons won’t destroy the enemy quickly enough to prevent them from wreaking havoc on your own troops first. 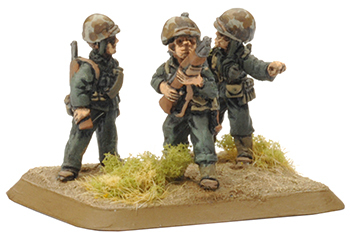 One way to protect your troops in the meanwhile is to fire smoke at the enemy to temporarily impair their vision. Only weapons listed as having the Smoke attribute in their Arsenal may fire smoke. 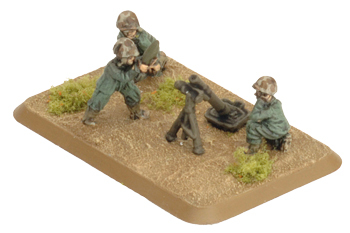 Some weapons such as the M1 81mm mortar can also fire Smoke Bombardments (see page 136 of the main rulebook). 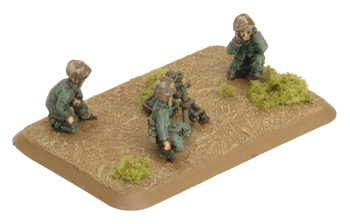 d. 1x Crouching NCO. e. 1x NCO gesturing with right hand. h. 2x Crewman with hands over ears. i. 4x Crewman with 81mm mortar bomb. j. 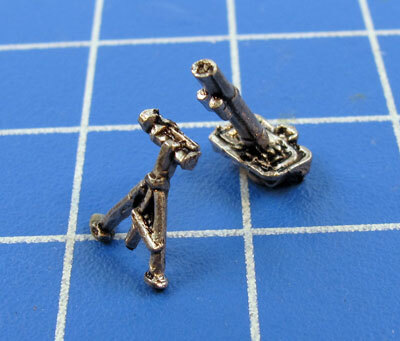 4x 81mm mortar sprue. k. 3x Crewman with 60mm mortar bomb. 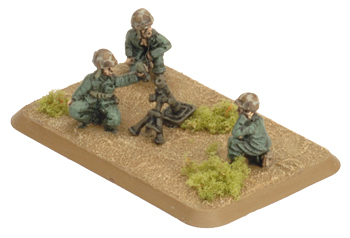 l. 3x 60mm mortar sprue. 1x Small three-hole base. 4x Medium four-hole bases. 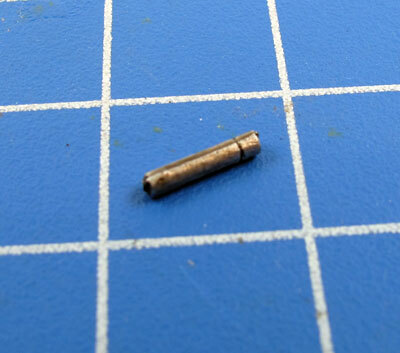 1x Base plug sprue. Place the officer (a.) standing NCO (b.) 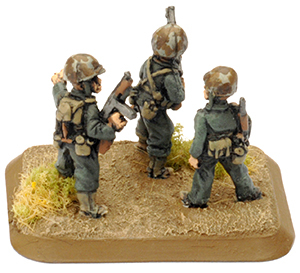 and standing rifleman (c.) on the small three-hole base. 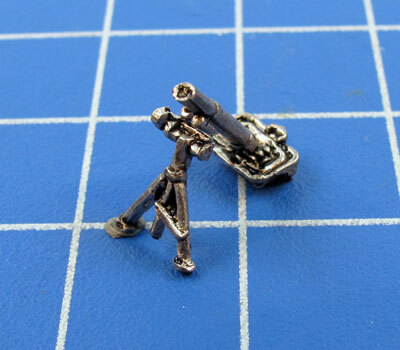 Whichever mortar option you have decided to field, assembling the mortars themselves is quite simple: just attach the mortar bipod to the mortar tube as shown below. 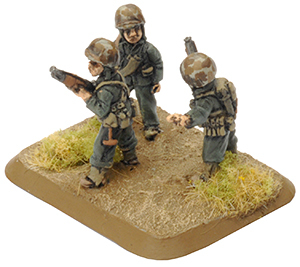 Below: The other piece on the 81mm mortar sprue is an ammo canister, which you can use as extra decoration on the 81mm mortar bases. 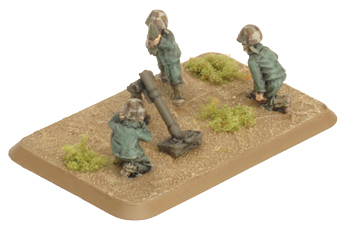 Each M1 81mm Mortar team should have an 81mm mortar, a loader holding an 81mm bomb (i.) and either an NCO (d. or e.) and another crewman (f., g. or h.) or two other crewmen. 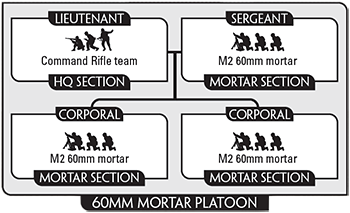 Each M2 60mm Mortar team should have a 60mm mortar, a loader holding an 60mm bomb (k.) and either an NCO (d. or e.) and another crewman (f., g. or h.) or two other crewmen.